"The body needs to maintain its internal electrical environment at the optimal levels for life and health. All chemistry is based on the movement of electrons, and when there are shortages of electrons, our chemistry is affected. For example, we've all heard about Vitamin D deficiency. When we are not grounded, most of us are electron deficient. Grounding, simply and naturally, helps restore electrons to our bodies. Ever since the wide-spread adoption of modern footwear and the expansion of synthetic soled shoes, people have noticed wonderful feelings of well-being when they walk barefoot on the earth. Pluggz are shoes that enable us to have this same "grounding" feeling – and the benefits - while walking outside when making direct contact with the ground – and looking great at the same time." Essentially, to feel our best, science maintains that we should frequently connect with the Earth, or remain "grounded," so as to optimize our inner heath and well-being. Pluggz shoes add a dimension with what's known as conductive footwear. Most footwear is electrically insulating, as are building materials. Furthermore, many of these materials rob us of naturally occurring electrons. Consequently, we spend most of our time having a shortage of electrons. This affects the chemistry of our body in ways that we are only beginning to understand. Studies done in the last decade have shown that excess positive charge can cause inflammation that can be reduced by making regular contact with a source of free electrons. One way of tapping into the earth’s abundance of electrons is to go barefoot on soil, sand, or even concrete. Another way is to wear footwear, like Pluggz, that allows electrons to pass through it. Through their scientifically sound construction, Pluggz footwear allows us to connect to the Earth when we make direct contact with the ground – grass, sand, soil, unsealed tile/stones, gravel, concrete – even city sidewalks. This unique construction allows the electrons to pass freely from the earth through our bodies, promoting a more natural flow. Pluggz offers many different, on-trend styles of footwear to promote health through the process of grounding. 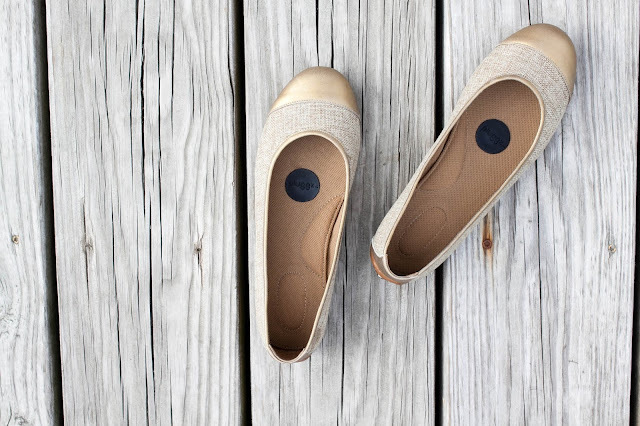 My current favorite pair are the ballet flats which come in a variety of colors and patterns. As for the "grounding" aspect, I won't lie. I was a little skeptical at first. The science nerd in me understood the concept and it made sense, I just wasn't sure that a shoe could actually promote internal well-being. What I do know about these shoes is that they are, by far, the most comfortable ballet flat I own and that's saying a lot. Between the trampoline heel and conductive plug, it feels like I'm getting a foot massage with every step. I've worn these shoes on several occasions, to places like the aquarium and Hershey Park, where there's lots of walking to be done, and while at the end of the day I tend to have some pretty wicked lower back pain, I had none of that on the days I wore these shoes. With Fall right around the corner, I've already taken a peek at their driving moccasins and loafers and can't wait to add a few more pairs to my closet. I think my favorites are the Persimmon Suede MOCS (how perfect is that orange tone for Fall?) and the Emerald Suede loafers (the jewel tones are so on-trend this season)! Use code "ASHLEY" for 10% off your order!